Did you know taking DHA omega-3 may help kids’ reading scores? A new study from the University of Oxford shows there may be a link between low DHA blood levels and poorer reading ability, working memory and emotional behavior. The study tested 493 children aged 7 to 9 years old who had lower literacy rates than their peers. The students who had higher blood levels of DHA had improved behavior, reading skills and working memory compared to the children with low levels of DHA. 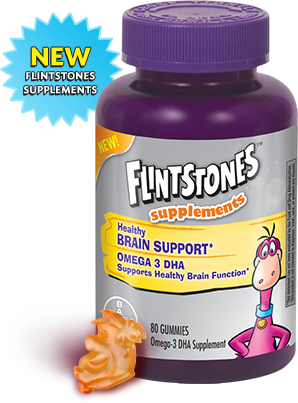 Most children do not consume enough DHA through diet alone, so talk to your family physician and consider a kid-friendly DHA supplement like Flintstones Gummies Healthy Brain Support. Can my two year old take her normal vitamin along with the flintstones brain and omega 3 dha? We recommend that you check with your healthcare provider before changing your (or your child’s) diet and supplement routine.